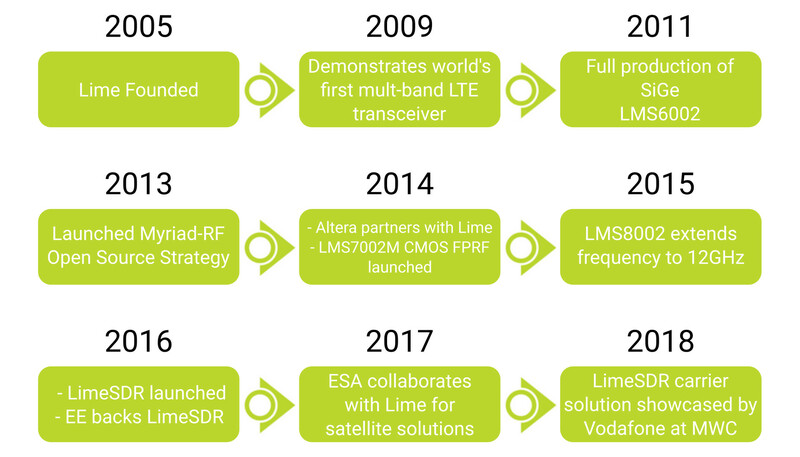 Lime Microsystems specialises in field programmable RF (FPRF) transceivers, SDR platforms and ecosystem technology for the next generation of wireless broadband systems. These products offer an unprecedented level of configurability and allow system designers to create wireless communication networking equipment that can be set and reconfigured to run on any wireless communications frequency and mobile standard. Business Model — A trusted ecosystem providing a complete solution, including manufacturing and systems integration and validation from the open source community. Largely funded from corporate sponsored crowdfunding campaigns generating pledges from over 10,000 backers. Here you can find details of the Lime Microsystems management team. Here you can find details of Lime's investors.